The marine environments beneath ice are arguably some of the least accessible on earth. Ice is a formidable physical barrier that can range in thickness from centimeters to hundreds of meters—an impediment that has not diminished our desire to uncover the secrets that lie beneath. In the heyday of manned submarines, under-ice was seen as an important operating theater, where the ability to listen and monitor one’s foes was crucial. As manned submarines have given way to unmanned vehicles, the duties of under-ice research have widened to include more fundamental motivations, as we discover more about how ice affects our climate and ocean levels—and seek to understand how these are changing. Reviewing the major milestones in the use of autonomous underwater vehicles (AUVs) under-ice brings to life how and why the vehicles have developed and helps us make predictions about the form and capabilities of the AUVs of the future. It all began in Spring 1972, when the University of Washington’s Applied Physics Laboratory (APL) deployed its Unmanned Arctic Submersible (UARS) beneath Fletcher’s Ice Island, an iceberg near the North Pole. This untethered robot, a direct descendant of the very first AUV, was deployed through a hole cut into the ice and conducted a series of out-and-back transects, collecting data related to the acoustic reflection coefficients from the underside of ice and the topography of the base surface. The UARS was equipped with an acoustic pinger, monitored by two ice mounted hydrophones. As the UARS performed its transects, the received signal – both direct and reflected – provided characterization of the acoustic environment and the reflectivity of the ice over a range of grazing angles. In addition, the signal was received by four tracking hydrophones that provided the position of the vehicle over an area of 0.8km squared. The UARS also carried a three-beam, upward-looking sonar that collected ice draft data. For AUV operators, a true mark of success is retrieval of the vehicle and data at the end of the mission. For UARS, this was an especially challenging task as the only route to the surface was through the small launch hole. To return a 10-ft. long vehicle with minimal onboard navigation and that has just conducted 17.5 miles of transect, a homing system was developed prior to deployment. This consisted of a single acoustic beacon suspended through the recovery hole. On board the UARS were two forward-facing directional hydrophones and an aft mounted, omni-directional hydrophone. The received signal from the beacon triggered the UARS to return home and steer on target. Using time-of-arrival differences, the UARS could distinguish the bearing to the beacon and understand whether it was facing towards or away from it. Upon arrival at the site, a barbed probe on the nose of UARS entangled with a suspended recovery net, allowing recovery by the gantry. As new technologies emerge, there will inevitably be leaps taken to push the envelope of what is possible. 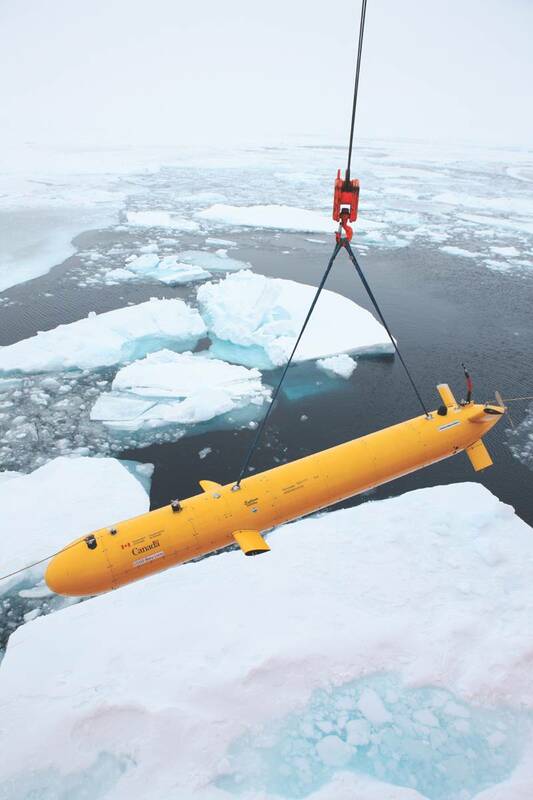 For under-ice AUVs one such leap was Theseus. Developed by International Submarine Engineering (ISE), Theseus was a 10.8m, 8,600kg giant, designed to lay up to 220km of fiber optic cable in ice-covered waters. Theseus implemented a layered and modifiable software architecture for real-time control. This system relied on a fault detection and response system to handle error events though the various stages of a mission. To handle the navigational requirements of such long distance transects, a ring-laser-gyro system coupled to a doppler velocity log – measuring relative speed – was employed to deliver positional accuracies of better than 1% of distance travelled. An external acoustic system was used for cable delivery and vehicle recovery. 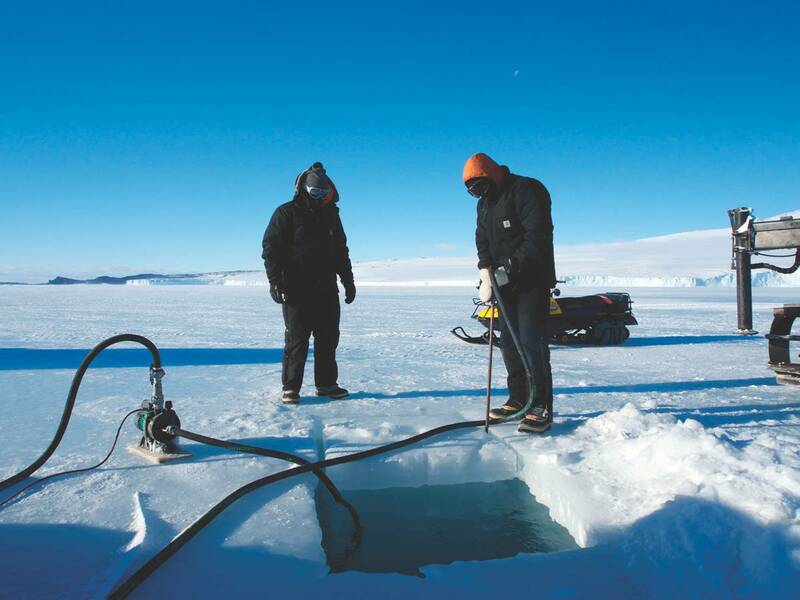 In April 1996, following initial endurance testing and trial, Theseus completed a one-way transect of 175km in the ice-covered waters north of Canadian Forces Station Alert. Launching consisted of a gantry launch through a 2m x 13m ice hole. The mission had a series of six acoustic beacons along the path to aid in directional homing, with the first two monitored for telemetry contact. At the mission terminus, Theseus was required to fly through a 200m wide metal loop to capture the cable; as it approached, manual control was enacted to fly the vehicle through the goal. At this point, Theseus parked under the ice and awaited instruction. Following cable recovery, a position update was provided and the journey home began. Near the end of the return trip, a failure to home on one of the beacons enacted the fault control and Theseus again parked under the ice. Using telemetry, final instruction was given to return to the launch hole. Following this record-setting run of 350km, Theseus completed a follow up mission of 320km. Following successful missions beneath sea-ice in the North Weddel sea in 2001 to survey Antarctic Krill, an ambitious five-year program was initiated to investigate the marine environment beneath floating ice shelves. 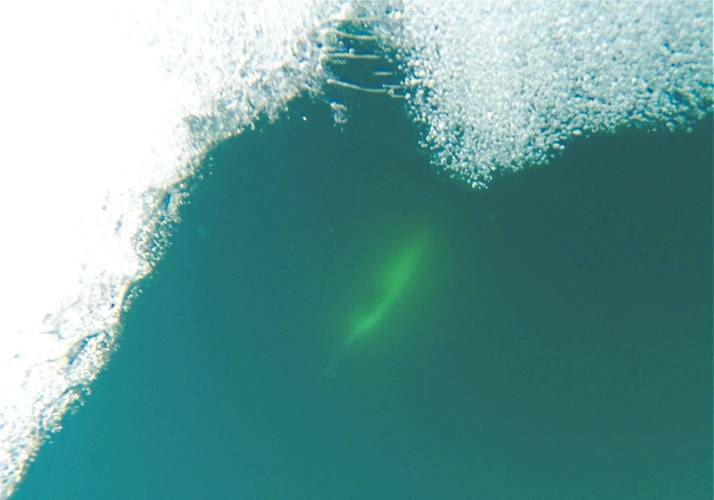 The Autosub Under Ice (AUI) program of the U.K.’s Natural Environment Research Council (NERC) would investigate both the Arctic and Antarctic using the Austosub-2 AUV, designed and built at the U.K.’s National Oceanographic Center, Southampton. 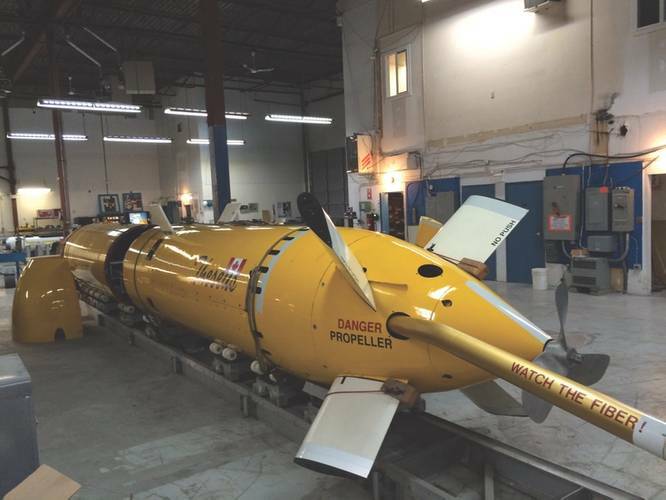 This 7m long, high-endurance AUV included an advanced positioning system which consisted of a fiber-optic gyro and both upward and downward Doppler velocity logs (DVLs) for bottom, under-ice, or water column speed tracking. The Autosub-2 had a obstacle avoidance scheme that could allow it to venture into unknown environments. From 2003 to 2005 the Austosub2 performed under-ice missions in both the Antarctic and Arctic, where a number of major feats were accomplished including the first multibeam image of the underside of sea-ice, taken off northeast Greenland. A major milestone was reached in 2005 when the Austosub2 ventured 25km beneath the Fimbul Ice Shelf; an amazing first for an AUV. This mission allowed retrieval of data in an environment virtually unreachable by previous means and yielded the first ever image of the shape of the underside of an ice shelf, showing a much richer topography that previously thought. The Austosub program showed what was capable with an AUV operating under ice, but also highlighted the real risks involved: on a follow up mission beneath the Fimbul Ice Shelf in Antarctica, the Autosub’s emergency beacon was heard, indicating an abort. At a location about 14kms from the edge, the Autosub-2 was lost. Following the loss, two outcomes emerged. The first was a realization that the risks of AUVs operating under ice need to be better understood. As a result, a body of work began to emerge from Southampton involving much of the wider AUV community to try and model the failures of AUVs. The objective was to help predict, or at least quantify, the potential risk of loss and has benefited today’s under-ice operations. The second outcome was the development of Autosub-3, a new vehicle that would go on to successfully survey beneath the Pine Island Glacier in Antarctica in 2009. In 2010 International Submarine Engineering (ISE) once again raised the bar for distance and endurance in under-ice operations. This time, their Explorer AUV, a 7.4m long, 5,000m depth-rated vehicle, would be tasked with measuring the topography of Canada’s Northern continental shelf. Submerged for 12 days, the Explorer would conduct three missions: a 320km transect departing a near shore ice camp to a remote camp located on an ice floe; a 280km mission out from and back to the remote camp; and a 320km return trip. During these missions the AUV would not be recovered, but would instead dock at a through-ice capture system developed and tested the previous year by Memorial University of Newfoundland. This system would allow the AUV to be held fast, charged and provided with a wired connection for data exchange. It also supplied a means to realign the internal navigation system. To reach a remote point after such a long journey, a novel homing system was developed to allow the AUV to steer toward a single, low frequency sound source. For those of us who hope to stand on the shoulders of the aforementioned giants, what will the next generation of under-ice AUVs look like? No doubt they will be more efficient, with new power sources, enabling endurances beyond the hundreds of kilometers into the thousands of kilometers. They will be more aware of their surroundings, relying less on pre-scribed mission scripts and more on general guidelines where the missions can adapt to what is sensed. Improvements will be seen in how they navigate and position themselves, relying more on perspective observations of the environment and self-generated maps. We will see developments into physical interaction, adding to the existing remote sensing capabilities, where physical samples may be taken from these remote areas. Under-ice AUVs will become more common, and with that, more reliable to the point where their use will be ubiquitous in the collection of critical data locked away below the ice. 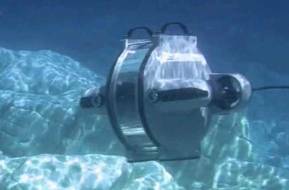 We will even see them used in the ice-covered oceans of other worlds, such as Jupiter’s moon Europa. (see related story on page 22, this edition). AMC is establishing an AUV research facility to house a fleet of AUVs, include a new Explorer class AUV from International Submarine Engineering (ISE) for under-ice exploration in Polar Regions.